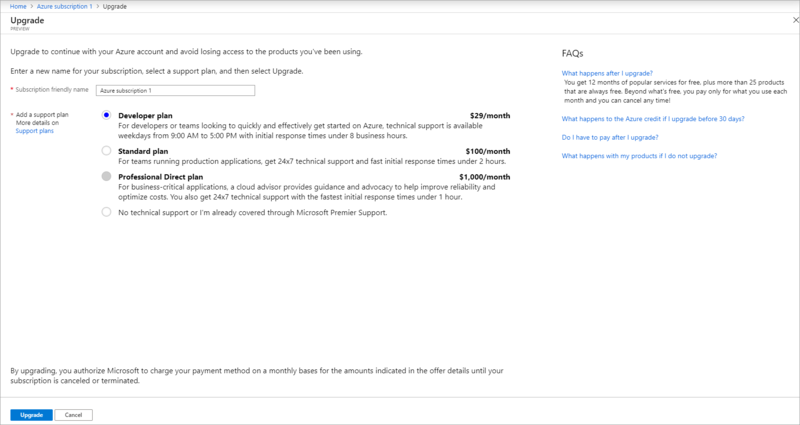 If you have a Free Trial or an Azure for Students Starter subscription, you can upgrade to Pay-As-You-Go in the Azure portal. If you have an Azure for Students Starter subscription and are eligible for a Free Trial, you can upgrade to Free Trial. When you upgrade from a Free Trial subscription, you keep your remaining credit for the full 30 days after you created the subscription. You also have access to free services for 12 months. Select your Free Trial subscription. In the subscription overview blade, click Upgrade subscription in the command bar. If you don't already have a payment method for your Free Trial subscription, you'll be prompted to add one. You might need to enter a phone number to verify your identity. Type in a name for your subscription. By default, the name is Pay-As-You-Go. Choose a support plan for your subscription. To learn more about support plans, see Azure support plans. When you follow the steps below, we will give you the option to upgrade to a Free Trial if you are eligible. Select your Azure for Students Starter subscription. If you're upgrading to Pay-As-You-Go and don't already have a payment method for your subscription, you'll be prompted to add one. Type in a name for your subscription. If you're upgrading to Pay-As-You-Go, choose a support plan for your subscription. To learn more about support plans, see Azure support plans. 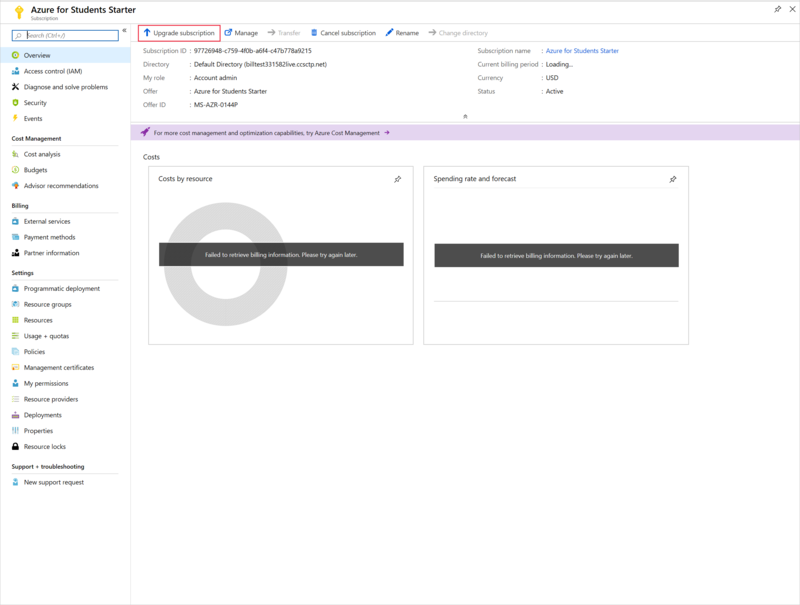 Now that you have a Pay-As-You-Go subscription, see Prevent unexpected charges with Azure billing and cost management.